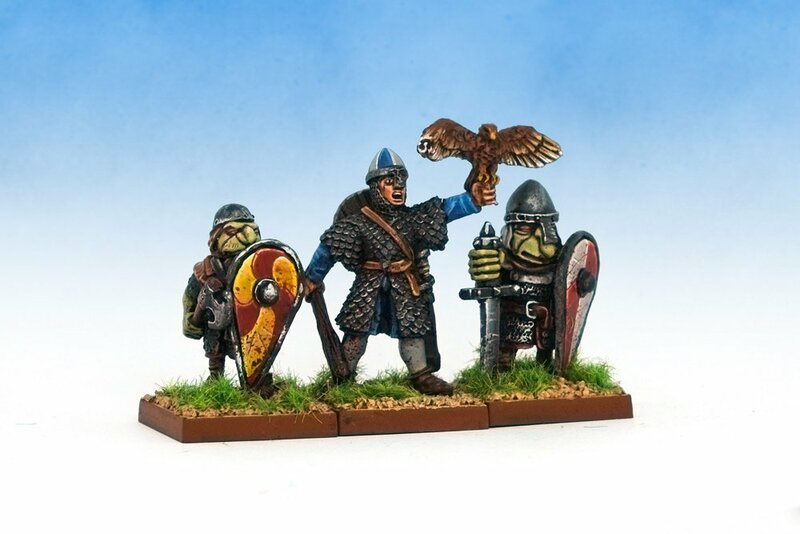 Lord Tisserand with his hawk Antonius, accompanied by two Gnolls. Lord Tisserand is a simple conversion of the Wargames Foundry ex-Citadel Normans with the arm from a Black Tree command figure holding a hawk swapped in to make him a regimental champion. I also sculpted on a strap so he could carry a shield while waving around the Bird of Command – but that’s barely worth mentioning as this sentence took longer to type than the strap took to sculpt. You can see the original figure as it appeared in White Dwarf 92, with the cliché French names variously inspired by Inspector Clouseau, Rémy Martin cognac, Marie Brizard liquer and maybe ‘Allo ‘Allo characters. And just what is the French for “cliché”? Why a hawk? Hawks were a symbol of authority in Norman times. The Bayeaux Tapestry initially shows Harold holding a hawk, and switches to showing William holding a hawk when his claim to England’s throne becomes legitimate. I might push this idea of animals symbolising command into the realm of fantasy and model a Norman King on a giant hawk or griffon. I am enjoying the blend of historical and fantasy in the same project. Lord Tisserand and the Gnolls against Undead Wights. All three Gnolls I have painted now are variants of the same figure. In the above image the right-most Gnoll is the unadulterated miniature. The one on the left I converted with an arm and sword from a 1980s Citadel Goblin. The central Gnoll is the resculpted version that appeared in the later C13 range – who has the same body but a new weapon arm and head. Challenge now is how to convert future Gnolls to provide enough variety for a complete Gnorman regiment. I’m getting enormous pleasure out of watching fantasy elements creep into your Norman army, and the gnolls are great. My ears are currently pricked up for all things Norman after lately finding out the first of my line was standard bearer for William at the battle of Hastings. I don’t think he was a gnoll though. Stamford Bridge? Ha! More like “Stafford Bridge”! Amirite? That’s some claim to fame! Was he the dude that got to hold the papal banner that’s depicted on the Bayeaux Tapestry? ! That’s the one! I have heard he’s on the tapestry, though I can’t find an image. Robert de Tosny was he name, William made him change it later on. What did he change it to? Robert de Samedi? The top hat didn’t go with the chainmail sadly. Very interesting article and great painting and converting. 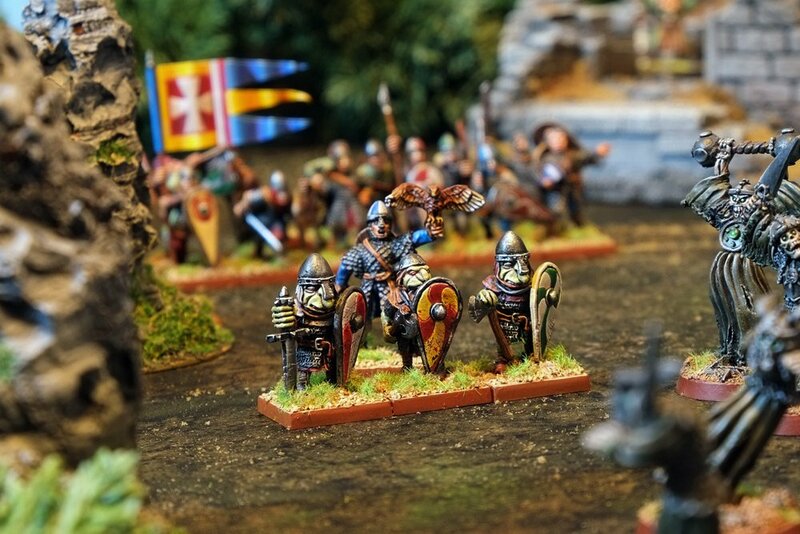 I love the idea of the Norman army with fantasy elements. The image of a warrior with its trusted animal companion is one that appeals to me a lot. Its something that I include in my toy soldiers quite often. If this was a historical army the bird would be a cypher for command, like in the tapestry, but now that the force is “Historical Fantasy” the bird is definitely present and able to communicate and perform important sub missions with surprising accuracy. Like Flipper or Skippy. The quartered helmet is a particularly nice element. Some great stuff here. (I’ve also been reading some of your other Norman posts!) 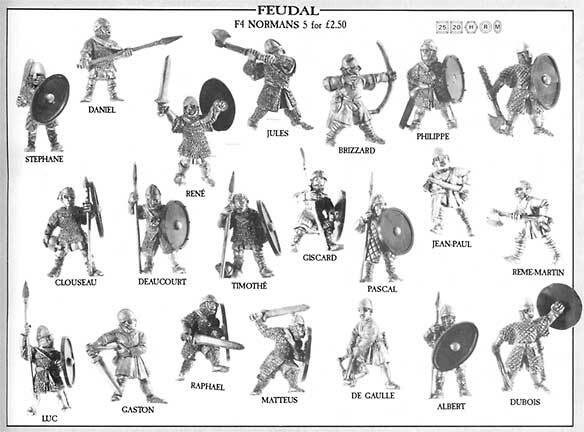 How do you plan on incorporating (or separating) the gnolls from the human Normans? Thanks! I dunno about future plans for having these two forces alongside each other – it’s really hard to get Gnorman Gnolls and so anything more than a handful to scatter into the force is a distant dream. A regiment of twenty made up just up Gnolls would be amazing though.